Got holiday gift-giving challenges? We have two questions that will put ‘em to bed for good. Shall we try? Here goes. How many adventure-loving humans are on your holiday gift list? Of those, how many are over the age of 18? We can tell you, point-blank, that we have alllllll of those gifts covered. Ta-dah! With just a couple of quick clicks, your holiday shopping is pretty much donezo. Tandem skydiving gift certificates are the greatest gift ever for lots of reasons: they’re crazy-easy to give, and they have the radical side effect of causing your lucky recipients to think of you whenever they look up. We’re here to tell you that tandem skydiving gift certificates are the be-all-end-all of holiday gift-giving. Not convinced yet? Here’s the facts. At Skydive Tecumseh, we’re proud to offer the easiest-ever online system to purchase tandem skydiving gift certificates and skydiving services — and there’s an offering for every budget! You can scale your gift up and down, from first-time get-your-feet-wet skydiving experiences to bombshell deluxe packages from our highest altitudes. (You can buy smaller increments, too, if you’re just trying to give someone a kindly little nudge.) You can even buy a gift certificate to give a special someone the gift of a lifetime: a course that will put them on the path to learn how to skydive solo. Guess what? As easy as a Skydive Tecumseh gift certificate is to give, it’s the farthest thing from a lazy, Grinchy cop-out. Seriously, it’s one of the most powerful, thoughtful, life-affirming, confidence-bestowing and fun gifts you can present to the (over-18) people in your life. It’s so fun to watch a giftee! What’s the best part of giving great gifts? The looks on the faces, of course! When you give a skydiving gift certificate, you’re going to be as thrilled by the reactions you get as your recipient will be to get the gift. A skydiving gift certificate is just awesomely unique, with a sense of adventure and promise you’re not going to find behind any other wrapping paper. Opening this gift is gonna put their jaws into freefall. Full stop. Great gifts are memorable gifts. Right? Who cares about a trinket after the initial dopamine hit passes? Who cares about a gadget that fades into technological obscurity six months into the new year? Hear this: A tandem skydive is a life experience your recipients are literally going to remember for a lifetime. It’ll open horizons; it’ll go down in the history books; it’ll inspire. 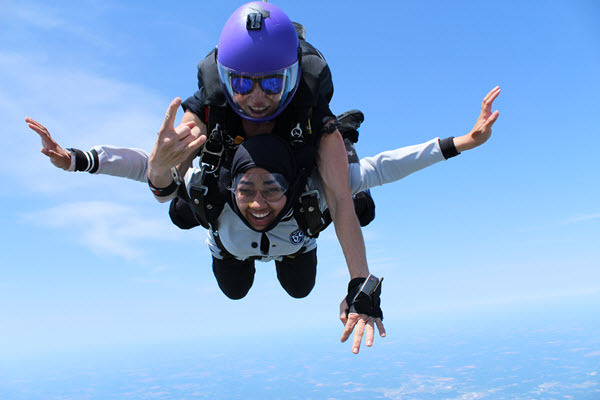 The benefits of making a tandem skydive go way beyond the cheek-flappin’ thrill of freefall, and you’ll be a part of the reason your giftee’s smile is that much brighter now. Wanna stuff some stockings with superhero savoir-faire? You know it! Let’s get something under the tree and hung on the mantel that rolls the throttle of adventure way open. Got more questions? Lay it on us! We’d love to answer them. Get in touch today!